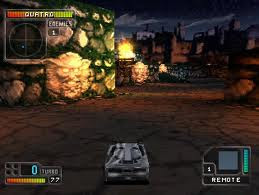 To get Rockets in twisted metal players must clear Dollface Event #2. To unlock SMG weapon simply finish Sweet Tooth Event #1. To have 12-Gauge Shotgun reward just finish Mr. Grimm Event #4.
for Laser unlocking try to complete Dollface Event #5.
to unlock Laser Pistolunlock : you must Successfully beat the Story mode on the Twisted difficulty. for Magnum Revolver reward unlock : gamers have to complete Sweet Tooth Event #4. For Absorption Shieldunlock : players must finish Mr. Grimm Event #3. to do this simplyPress Right + Triangle to activate. Rear Freezeunlock : players must finish Sweet Tooth Event #3. just Press Up + Triangle to activate. For Super Mineunlock : players must finish Mr. Grimm Event #5. it's easy just Press Down + Triangle to activate.